Glacier National Park Cabins allow visitors to rest their weary bodies in comfort and privacy after a day of adventuring. Unlike lodging accommodations, there are no other visitors to intrude on your solitude. And unlike Glacier National Park camping, your nights are guaranteed to be warm, comfortable and mosquito free. For families, there’s no better way to bond. 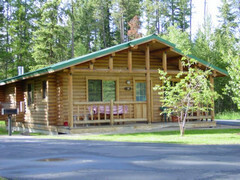 Glacier National Park cabins are diverse in appearance, hospitality accommodation, and price. Your vacation in Montana will always be treasured. 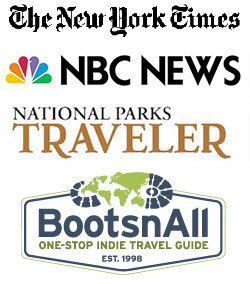 What Are My Rental Options For Glacier National Park Cabins? Ready to discover the best Glacier National Park Cabins available for you? Read on. The Historic Tamarack Lodge & Cabins provides easy access to Glacier National Park at a fraction of the cost of in-park lodging options. 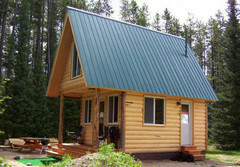 The Historick Tamarack Lodge & Cabins – Classic Ambiance with Modern amenities Great outdoor location. Located on the Flathead National Forest. Snowmobiling, x-country skiing, snowshoeing and ice fishing. Great summer fun in a rustic location. Family owned and operated with passion for the outdoors and making great personal connections. We have many repeat guests to our Lodge and fans from all over the world. Have you stayed at Tamarack Lodge & Cabins? Share your experience and write a review! Smoky Bear Ranch in West Glacier, Montana offers two kinds of cabin rentals: the exquisite Grizzly Cabin and the modest Little Bear Cabins. The Grizzly Cabin is a four-bedroom/two bath log home with a full kitchen, laundry facilities and sleeps up to 12. However, the dining area and cutlery equipment is only enough to service 10 people. The enormous living area is equipped with a full size folding futon, rocking chair, couch and satellite TV (and DVD/VCR player). Additionally, there’s a Country wood stove to warm your bones during the chilly Montana nights. The Little Bear Cabin is a cozy 500 sq ft cabin with a porch that overlooks a pond and the Apgar Mountain Range. There’s a single loft bedroom, kitchenette and one bath. With a queen bed and two twins in the loft, and a futon sleeper sofa on the main level, this cabin sleeps up to six but that’s going to be a tight, cozy fit. 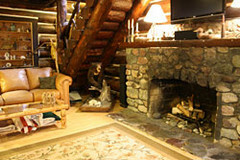 Have you stayed at Smoky Bear Ranch? Share your experience and write a review! Located just ½ mile from Glacier National Park’s west entrance, Glacier Outdoor Center offers one-bedroom cabins (sleeps six), two-bedroom cabins (sleeps 14), and two bedroom deluxe cabins (sleeps 14, but has extra space along with a washer/dryer) in West Glacier, Montana. These are roomier than most Glacier National Park cabins available for rent, but the price certainly shows it. All cabins are non-smoking and no pets are allowed. Glacier Outdoor Center also provides free wi-fi to its guests. Have you stayed at Glacier Outdoors Center? Share your experience and write a review! Glaciers’ Mountain Resort is nestled in West Glacier, Montana and offers five one-bedroom log cabins. It’s an intimate location with friendly hosts that are friendly and accommodating to your needs and questions. Each cabin can accommodate four people (queen size bed and futon), has a TV/VCR, a natural gas fireplace, and offers views of the Montana mountains from your porch. A nice bonus: if you book for seven nights, your final night is half price! Have you stayed at Glaciers’ Mountain Resort? Share your experience and write a review! In my opinion, Polebridge Montana is Glacier National Park’s paradise within paradise. It’s remote, awe-inspiring, and truly America’s final frontier town. And the Glacier National Park cabins available here fit just perfectly with Polebridge, Montana’s vibe. Cabins are only $30 a night (compared to the average $200!) and come furnished with beds, a table, wood heating and propane lights. However, you need to bring your own sleeping bags and pillow, cooking utensils and water jug. It’s rustic. It’s unique. It’s not for the feint of heart (your bathroom is an outhouse). But it’s an experience you’ll never forget. Have you stayed in a Polebridge Cabin? Share your experience and write a review! Izaak Walton Inn is located between West and East Glacier Montana, making its location less than ideal as a base camp for Glacier National Park. It’s also a little more touristy and sterile than other Glacier National Park cabins. The cabins are right next to each other, affording you barely any privacy. They sleep up to 4 people and have full kitchens. For the price, you can find far better options. Have you stayed at Izaak Walton Inn? Share your experience and write a review! North Forty Resort is located in Whitefish, MT, making its location even less ideal than Summit Station and Izaak. Even though Whitefish is a cool, hip town, if you’re looking to adventure in Glacier National Park, you’re going to spend far too many hours commuting back and forth to the park. Cabin options are single-family cabins that can sleep 5 people and duplex that can sleep 8. All come with full kitchens, gas fireplaces, covered porches and picnic tables. Have you stayed at North Forty Resort? Share your experience and write a review! Glacier National Park cabins are without question a unique way to view the park. In my opinion, if you plan to stay in a cabin, choose one of the options in West Glacier, Montana or the rustic Polebridge, Montana cabins. Additionally, there are cabins available for rent at the Apgar Village Inn and Lake McDonald Lodge in West Glacier Montana.